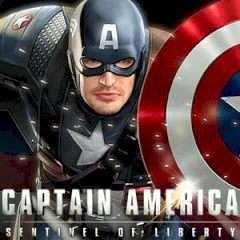 Captain America is the ultimate sentinel and the guardian of the innocent people. When the city is in danger, nobody except our brave hero can deal with various thugs who terrorize the city. Stop them and release the city! The city is upon the great threat and there is nobody who can save the citizens except Captain America. Get on the streets of the city and deal with all that thugs who are teleported by the main villain. Use your shield to block the attacks or throw it to destroy the distant target. Use your combat skills and proceed further until you reach the exit!